Have you heard of the "Everything Doughnut" from The Doughnut Project? If you haven't you're about to. Nothing is more authentically New York than a decent, properly made (as in, boiled before baked) bagel topped with poppy seeds, sesame seeds, onion, garlic, and salt. So, it's only fitting that a New York City doughnut newcomer creates the most outlandish, yet beloved doughnut in the Big Apple: an everything doughnut. 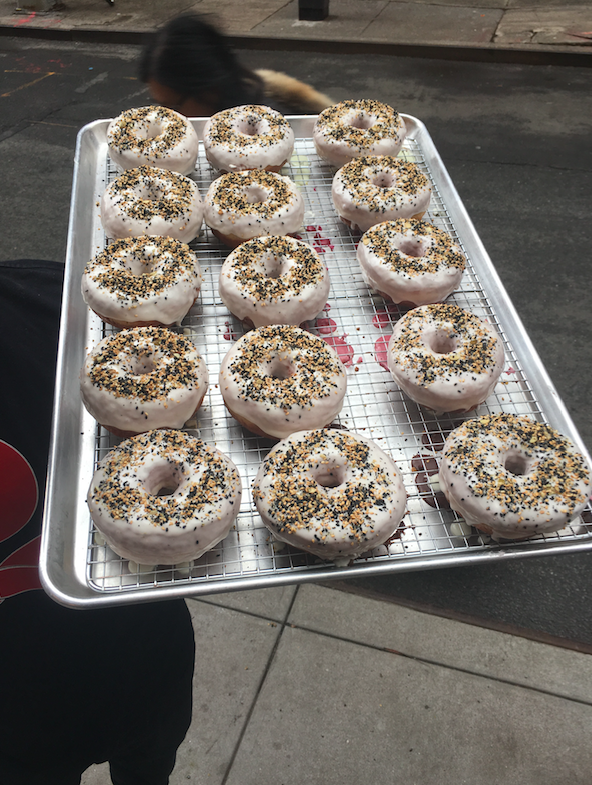 That's exactly what The Doughnut Project did, astounding residents of NYC with this simple, yet unconventional combination of a yeasted doughnut and the flavor of an everything bagel. At first, we were wildly interested in the potential flavor profile of an item that we've come to accept as a sweet treat. Would predisposed ideas of the savory flavors of an everything bagel distort our tasting experience? How would we deal with the light and airy texture in comparison to a dense bagel? These are the questions we contemplated as we turned the corner of Morton Street. It's a rather unassuming area that you would never guess hid the kitchen of a creative doughnut mastermind. We weren't even sure if we had the right location, until we noticed a small white sign with a red doughnut with a substantial bite taken out of it, hanging over a window lined shop. Outside, standing conspicuously on the street, was a man holding a sheet tray filled with everything bagels... jackpot. The shop itself was relatively small, especially considering that they were the winners of the crowd favorite category for last month's Donut Festival. We took in the bright walls, welcoming staff, and wafts of sweet, carboloaded pastries that would soon line our hips. In short, we were in love. We dutifully ordered two everything doughnuts, one beet and ricotta, a maple bacon, and a salted chocolate with buttered pretzel. We made our way back to the spoiled HQ in Chelsea, wondering whether or not the quantity of poppy seeds and sesame seeds would be off-putting, or whether or not we could stomach garlic and onion at 10 a.m. on a Thursday. If you've ever seen our Snapchats, you should know that food doesn't last long at spoiled HQ. We were starving and pretty damn curious to know what the fuss was about with this play on an iconic NYC food. They looked delicious. With a sweet cream cheese glaze and a rather generous helping of everything toppings, it looked unassuming. Little did we know that we were about to get a fist to the tastebuds from the combination of the sweet, salty, and savory doughnut. Listen, we're all about the bagel life, but three out of five of us here aren't big fans of everything bagels. From the start, a majority of us weren't even that keen on trying out this combination. That said, we all dug in. Our reactions were pretty intense, and understandably... It's a freaking everything doughnut! It tastes like an everything bagel with light cream cheese. It was fresh, well executed, and interesting. However, only one of us would really eat it on the reg, one of us might mess with it after lunch, and three just generally didn't like the combination of garlic, onion, and sweetness. From a culinary standpoint, it's a brilliant creative step towards playing with a person's preconceived notions of savory and sweet items. The fact that a doughnut could be the vehicle to deliver these flavors opens up a world of doughy possibilities into the savory realm. Just to throw out a few potential experiments for the pastry stars at The Doughnut Project, how about a salted potato chip doughnut? A pizza combo? A fried chicken and waffles doughnut? For now, we'll stick with their beet and ricotta which, for this writer, was probably the most delicious thing we've eaten in the past five years, and that's saying a lot since two of those years were spent at culinary school. It was that good. The Doughnut Project is located at 10 Morton Street. Check them out from 8 a.m. until they sell out on Mondays to Fridays and 9 a.m. until they sell out on Saturdays and Sundays. Check out 6 Best Spots for the Most Delicious Beignets in NYC.